My grandfather once told me that it doesn’t matter how well you plan things out, there will always be unexpected events to trip you up. Of course, we were talking about finances, but I think that his lesson applies equally well to life in general. Oksana and I have been looking forward to going on a vacation together since last December. Finances are really no longer a problem as we can save up vacation money fairly easily, but getting the time off from work is an entirely different matter. I have the university calendar year to plan around, while Oksana has to give consideration to her job at the Mendenhall Auto Center. Fortunately, we knew far ahead of time what we wanted to do. There was a family reunion (on my father’s side) scheduled for late June in Daytona Beach, and we also wanted to visit my mom parents on the beach in N.C. We asked our respective bosses early and were lucky enough to find two weeks in June that we could both afford to be gone. Even though we had such advance warning, Oksana and I made a mistake. Instead of booking our tickets as soon as we’d received permission from work, we procrastinated. We thought it would be okay since we still had more than six weeks to go V-day, but we underestimated the number of people who go on vacation in June. The flights weren’t full yet, but we lost our opportunity to purchase a “saver” ticket with our accumulated miles. Further complicating matters, we needed to take a roundabout flight path. Alaska Airlines (where we have a mileage plan) only flies to a handful of cities on the East Coast, so in order to spend a week in both North Carolina and Florida, we decided to fly round-trip to Orlando and purchase another ticket to Norfolk, VA, on the side. We could have done all that by cashing in 40,000 miles and paying $144 each on airfare. Instead, we ending up cashing in 73,000 miles, paid $175 to purchase 7,000 extra miles, and spent $250 each on the additional FL-to-VA tickets. Lesson learned. As June approached, we hardly had any time to look forward to our vacation. I was very busy trying to complete as many projects as possible and had even gone so far as to reserve my entire Memorial Day weekend to work on another video club project. Oksana was gearing up to begin her CPA training with a huge set of training books and CDs she had purchased on eBay. With all that was going on around us, we couldn’t wait to leave it all behind to get in some nice, relaxing beach time. And then, on Saturday, we received some very bad news. Oksana’s mom has had another stroke. A bad one. Nadia had never fully recovered from the stroke in 2002 that had paralyzed her left side. After it had happened, Oksana spent seven weeks in Russia helping her to recover and trying to find a way in which she could be care for long term. Since then, been looked after by her husband, her brother’s family, a live-in nurse/physical therapist, and, quite generously, buy her sister-in-law. Because her sister-in-law lives with her own family in Irkutsk, Oksana’s family was able to work out a system where her mother and aunt would alternate living between Petropavlovsk-Kamchatski and Irkutsk, depending on the seasons. And over the last year and a half, Nadia’s improvement has bordered on the miraculous. She has managed learn to talk again, has conquered the dizziness that used to occur whenever she sat up, has learned to walk again with the help of a cane, and even has limited use of her left arm. Since the first stroke, Oksana tells me that she’s had trouble keeping her emotions in check, but otherwise we’ve all been amazed at how well she had recovered. As I understand it, there were no indications that another stoke was coming. Saturday afternoon (Sunday morning, Irkutsk time, I think) Nadia simply collapsed in the kitchen on her way to pick up a book. Her sister-in-law, a doctor, was right there and immediately set about doing whatever it is that doctors do for stroke victims. She called her daughter-in-law, another practicing doctor in the family that even specializes in stroke victims, and they had her in bed, medicated, and hooked to an I.V. as quickly as could be expected. Throughout all this, Nadia was non-responsive. They decided to call an ambulance. It’s hard for me to remember at times, but Russian medicine isn’t the same as it is here in the States. The paramedics knew less about how to handle the situation than the member’s of Oksana’s family, and when they called it in to the nearest hospital, they confirmed that if she was brought in, the level of care she would get would actually go down. Faced with that information, they decided to let the ambulance go, keep her under close watch, and try to get her to a better hospital on Monday. When they tried on Monday to get Oksana’s mom into the “good” hospital, they had to overcome a lot of resistance. Apparently, most Russian hospitals have a policy of not admitting second-time stroke victims. Fortunately, the two doctors had enough clout to get past the regulations, but when the doctor on duty realized that she’d been admitted, he hit the roof. By that time, though, she was already in intensive care, and they couldn’t very well release her. The first we heard of this was when Oksana received a call from her brother on her cell phone. She was driving home from shopping and had to pull over because she knew right away that it wasn’t going to be good news. She was composed, though, stoic, when she came home. Ever since her mom had her first stroke, we’ve known that it could happen again. This didn’t blindside her as the news of her father’s death had. Still, we both knew that that simple phone call had changed our summer plans. Oh, I kept hoping that somehow, someway maybe things could still work out. Maybe her mom would be okay or maybe Oksana could get to Russia and back in time to go to the beach. Deep down, though, I knew that wasn’t going to happen. I put my video editing plans aside and let Oksana use the computer to look up flight information. Even I knew that the weekly flight from Anchorage to P-K is only on Fridays, so she set about finding alternate routes. Juneau-Seatlle-Korea-Vladivostok. Juneau-Seattle-New York-Moscow. Nothing was convenient and the short-notice prices were up to $3000 for a one-way ticket. Armed with a lot of indefinite information, Oksana called her brother back. Andrey had arrived in Irkutsk and had spoken with the doctors. Nadia’s condition had remained unchanged and, furthermore, no visitors (not even family) were allowed into the ICU. He told Oksana that unless her condition changed, for better or worse, she should just wait until the Friday flight. Oksana hung up and then tried to make reservations. But the Mavial offices, as well as any travel agents, were all closed for Memorial Day weekend. Russian airlines’ websites are not like what we’re now used to… Oksana’s only hope to make a reservation was to get someone on the phone. She called a friend in Anchorage, Anya, who just happened to know someone that works at the Mavial office. She promised to try to track her down. With nothing to do but worry, Oksana and I decided that the only way to get through the weekend would be to try to distract ourselves. Luckily, we had just borrowed a new season of Buffy the Vampire Slayer DVDs to take our mind off things. On Monday we found out that Mavial had cancelled the Friday flight to P-K due to low ticket sales – the next flight wouldn’t be until the following week. Oksana called her brother and asked his opinion on what she should do. Andrey told her that their mother was still in ICU and as long as she was there, the doctors wouldn’t allow anyone in to visit. His recommendation was to make reservations for next Mavial flight, but to be ready to buy one of the expensive, express tickets at a moment’s notice. If her condition changed, for better or worse, Oksana would need to be there as soon as possible. Memorial Day weekend was eventually over and we went back to work. Oksana briefed her boss and we could do nothing save call Russia every so often for an update. Early Wednesday morning, we awoke to the sound of a ringing phone. The news was bad – Nadia had stopped breathing on her own. She was still in ICU, but the doctors were giving the family a sad prognosis; In their opinion, she had two, maybe three days left. Andrey asked Oksana to fly to Russia as soon as possible – in all likelihood to say goodbye. Wednesday morning, we both went back to work – if only because we had to. The very first thing, Oksana told her boss what happened and that, although she was sorry, she needed to leave for Russia on the first available flight. I’m sure it was apparent to him how frazzled her emotions were at that point, because when she asked to use some work time to contact a travel agent and to look for tickets online, he told her not to worry about it. And he meant it, too. Her boss spent the next half-hour on the phone with an Alaska Airlines representative. When he was finished, he called Oksana back into his office and told her everything was taken care of. Oksana didn’t understand what he meant until he gave her some printouts. One round-trip ticket, Juneau to Moscow, leaving the next morning at 8am. He had cashed in his own frequent flyer miles, paid the taxes due on the tickets himself, and denied Oksana the chance to pay him back. Good God, if only everyone had a boss like Steve Allwine. To top it off, he gave Oksana the afternoon off to go pack. I, myself, asked for the afternoon off from my own job so that I could help get Oksana ready. We had only a half-day to shop, pack, and get her on a plane that was bound to fly around the world: Juneau to Seattle. Seattle to Amsterdam. Amsterdam to Moscow. From there, Oksana would have to navigate the four, separate airports in the metropolis, find a flight to Irkutsk in Siberia, and pay for it at the counter in cash. It was obvious that the trip would easily last more than 24 hour, easy. This was an emergency trip, so Oksana didn’t need to pack all the American-type gifts that she normally takes with her on a trip to Russia. We were finished with our makeshift list (pack, find passport, leave engagement ring behind, purchase calling cards, print tickets… that kind of stuff) around 8pm and we went out to the Broiler for dinner. Our mood was somber, yet we still enjoyed what was to be our last evening together for some time. The next morning, Oksana boarded her 8am flight and I went back to work. I received a call from her in Seattle a few hours later, but didn’t hear from her again until she had sorted things out in Moscow. It was slightly before 5am on Friday morning when I answered the telephone and I wasn’t exactly at the top of my mental game, but Oksana was at least able to let me know that she was okay and had reservations on a flight to Irkutsk in a few hours. After hanging up, I slept better knowing that she was okay. I posted the “after-wedding” web log entry on Friday, because I know that there are a few people that use my ‘blog as a way of keeping up with Oksana and I. Undoubtedly, some of you didn’t even know that Oksana’s mom had had a stroke in the first place. It seemed that the best way to head off questions that wouldn’t have been pleasant to answer was to post a summery of the last year and a half. At the time I wrote the introduction to that entry, I had planned to write another quick entry on Saturday to explain why Oksana had to depart for Russia in a hurry. When I finally started, it didn’t take long to realize that, in typical fashion, I was going to go on far longer than I had expected. The problem was that I found myself divided: Should I write a simple update or something more meaningful about my feelings towards this emotional crisis? I couldn’t decide, so I just started writing. Barely one page in (marked above, with an asterix), late Saturday night, I got a notification on my computer that I’d just received an e-mail from Oksana. I paused in my writing, opened up my Hotmail account, and read with sadness the first communication I’d had with my wife since she was in Moscow. Oksana’s mother, Nadia Kadachigova, had passed away just six hours before Oksana had arrived. In her brief e-mail, Oksana gave me an account of what was happening and implied that she wouldn’t be able to call until after the funeral in P-K. I composed a sorrowful e-mail as quickly as possible, hoping that she might still receive it if she were still online. I needed to talk to someone, and with my wife out of reach, I decided to call my own mom. A short while later, I thought it more important than ever to complete this ‘blog entry and post it online. Friends and family need to know, but I was in no condition to spread the news by telephone. I started writing again, but something had changed. I felt that I owed my mother-in-law something more… it felt like I should scrap the update and begin a eulogy. I was torn. I felt as though, if I really spent my time on it, I could write a touchingly emotional piece – something I could look back on, years from now, and be proud of. It could take weeks, though, and many tormenting rewrites to adequately describe what I’m feeling… On the other hand, people who have read my previous ‘blog entry and have already lent me emotional and spiritual support were waiting for a promised update. Eventually, I decided to press on… but I only managed another page or so before my emotions got the better of me. I had to stop for the night. It’s Sunday morning now and although the words don’t come easily, I’m beginning to realize how much writing is a sort of catharsis for me. The prose may not be good, but it’s good for me. Throughout this weeklong ordeal, I’ve struggled with the fact that, after all our hard work and planning, Oksana and I will not be able to go on a vacation this year. I kept looking for ways in which Oksana could make it to Russia and back in time, could hold off going home until our vacation was over, or even ways I could cancel our vacation entirely – my attendance at my own family reunion included – so that we could save our annual leave and perhaps go later in the year. When I realized how bad the situation truly was, I mentally berated myself for being so selfish. What is my vacation inconvenience to what Oksana’s going through? She’s only 23 and she just lost both of her parents in little more than a year’s time. Because she moved to the States, because she married me, she wasn’t even allowed to travel to her father’s funeral nor was she able to tell her mother goodbye. I want to scream to the heavens: It’s not right! This isn’t fair! THIS SHOULDN’T BE HAPPENING! But it has happened. I’m 31 years old and up until the last few years, I’ve been remarkable lucky where the death of friends and family are concerned. Unlike many people I know, I still have all my grandparents, and I was fortunate enough to know almost all of my great-grandparents. Losing family is new to me and I still feel as though I’m the only one in the world who’s going through these emotions. But that’s not true. Everyone goes through this at some time in his or her lives and it’s selfish of me to think that I’m unique in my pain. It’s perfectly normal, natural even, and has been going on for millions of years. I tell myself that, but it doesn’t help. Baring the hypothetical “hit-by-a-bus” scenario, I will someday go through the same thing Oksana is going through right now. God forbid. For now, I’m trying to focus on the good things. 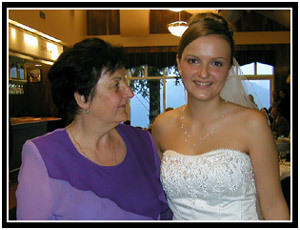 Two years ago, Oksana and I had a wonderful wedding where I was able to meet and interact with her parents. Unlike most people, I was never able to effectively communicate with my in-laws, but during the happy three weeks they were visiting, that hardly seemed to matter. Looking back, so many things could have prevented them from attending our wedding, not the least of which their being denied a visa by the United States government. I am so very grateful for the short, joyous time we had together. I will always lament that I was never able to tell them, in my own words, how much they and their daughter meant to me. But then… when I think back to our wedding, I realize that they couldn’t help but to have seen it for themselves. We attended the wedding in Juneau and spent memorable time with Boris and Nadia. It seems incredible they are both gone in such a short time. Although we didn’t speak their language we were able to communicate (as proud grandparents can sometimes do)We pray that God will bless and comfort Oksana and her family in this difficult time. Our heartfelt sympathy to you and Oksana. Though we never had the opportunity to meet Oksana’s parents, I know they were truly special people. We adore Oksana and know why you chose her as your wife. I know the pain is hard to endure, but you have to endulge in the wonderful memories you shared with them. We will keep you and Oksana in our thoughts and prayers. May God bless you both and comfort you. Val and I were so sorry to hear of your loss. We hope you can take comfort in the memory of your Mother and Father, the good times that you have shared and know that they are resting in peace. Passing was once described to me as like taking a long, peaceful nap after having a particularly hard and stressful day. I take comfort in this thought. Although we have not yet met Oksana (except online) we do feel that we know her from your blogs and the wonderful wedding video. She is part of our family now and we feel your loss and pain during this most difficult time. Our thoughts and prayers are with you and Oksana.